Located in the quaint village of Bellevue is Dyer Kiln Historic Site, where you can see the remains of the first limestone kiln in Eaton County. 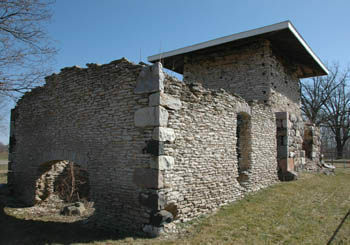 In the 1800s the kiln was used to burn the rock for the production of cement, and among the buildings still held together by Bellevue mortar is Michigan’s state capitol in Lansing. The limestone used in the kiln was mined across the street in the West and East Quarries. The abandoned limestone quarries, long since flooded into small lakes, are today the centerpiece of Keehne Environmental Area, an Eaton County park named for Edward Keehne. At 17 acres, Keehne Environmental Area is not big, not developed with waterslides or playscapes, not even that well publicized. The park is simply a pleasant little place for a short hike where children can absorb the beauty of the woods, look for waterfowl and other bird life, or possibly catch a few fish. 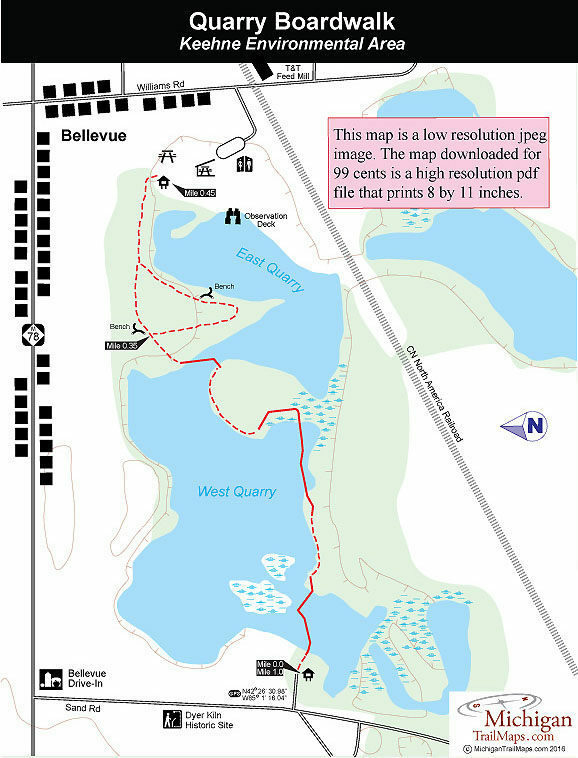 The park has less than a mile of trail that winds around the quarries but much of it are boardwalks across the West Quarry which makes for an excellent fishing pier for kids to try and catch panfish or even a northern pike. From the trailhead on the west side of the park you immediately descend a long staircase. 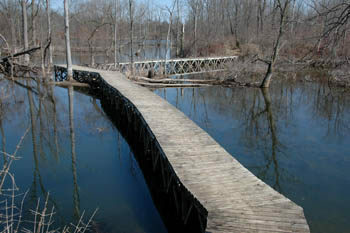 This is followed by a boardwalk almost a quarter mile in length that first crosses the West Quarry and then skirts its southeast shore. If you are packing along fishing poles, this is the best place to use them. A variety of panfish and even northern pike can be caught in either lake, but the boardwalk doubles as a fishing pier where children can easily cast into the West Quarry. From the east end of the boardwalk, a footpath continues past wildflowers and hardwood trees and comes to a junction with a bench at Mile 0.35 Head to the left (west) to follow a spur as it skirts the north end of East Quarry to Williams Road. You emerge in the day-use area at the east trailhead on Williams Street where there is a small picnic area with tables, a shelter. Parking lot and an impressive observation and fishing deck overlooking East Quarry. From there you backtrack to Sand Road but can take a small loop to see more of East Quarry before returning to the junction. The entire outing is only a round-trip walk of a mile. At the Williams Road trailhead there is a parking area, picnic tables, grills, a small shelter, toilet and a fishing/observation deck overlooking East Quarry. Keehne Environmental Area is open from 8:00 A.M. to dusk. There are no fees. From I-69, depart at exit 48 and head west on M-78 into Bellevue. Once in town, turn left (south) on Sand Road where the Dyer Kiln is posted. The parking area for the west trailhead is just down the road from the historic site. The east trailhead is reached from the Bellevue traffic light by following M-78 for two blocks and then turning left on Williams Road. Proceed almost to the railroad tracks and turn right at the park entrance sign.